The coffee filter sits on top of your glass. Heat water to a boil. While it is heating, grab your coffee mug and pour the condensed milk in. Assemble your filter so it sits on top of the mug. Add the coffee grounds and place the press inside the filter (on top of the grounds). Once the water is boiling, pour 1/3 cup into the filter and quickly cap it. (NOTE: The water must reach a rolling boil or your filter will not work optimally.) Now let it sit for about 5 minutes. Rich black coffee will start dripping onto the layer of condensed milk. After all the water has dripped through the filter, remove the filter and stir up the coffee and condensed milk together. Once they are thoroughly mixed, toss in the ice, stir again and enjoy! A note about coffee grounds: Ideally, use Trung Nguyen coffee. We have been using No. 3 and No. 5. They are both nice blends that work well with a single cup filter. If you use another brand, opt for the strongest bean blend you can find (robusta is best). This is because the filter is not design to produce much, so you need to make it extra strong, then water it down. When you mix the coffee with ice and condensed milk, it comes out with a nice bold flavor. Delicious! 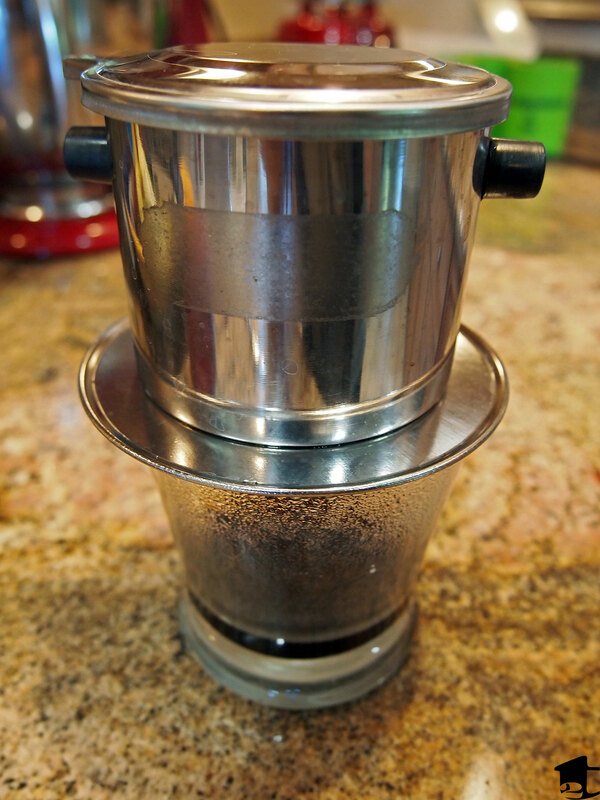 This entry was posted in Food and tagged Asia, coffee, drinks, foods, recipe, Southeast Asia, travel, Vietnamese coffee. Bookmark the permalink.